Have a fun party for your teen and keep your worries at bay using our tips. 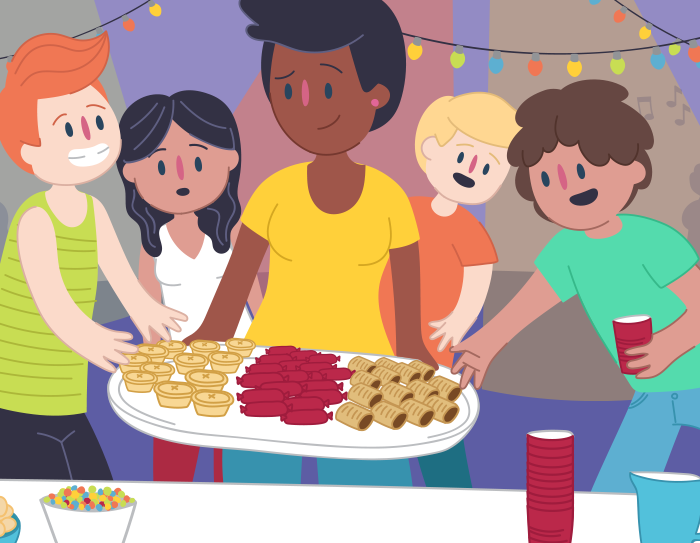 It can be daunting to think about hosting a teen party. But it doesn’t have to take a toll on your nerves or sanity! Follow these practical tips and suggestions to make it run smoothly and most importantly, make it a fun and safe event for everyone. Parties and hanging out with friends help kids build confidence and skills in social situations. Planning a party with your teen can be fun! It’s a chance to join together in creating something special that they’ll remember for years to come. The time spent together can strengthen the bond between you. Having a stress-free party means doing plenty of preparation in the lead up to the big event. Make sure you give yourself enough time so you can fit in around your other commitments. Try starting about 6 weeks before the party. If you’re having a party at your own home, here are our suggestions for helping things run smoothly on the day. Decide on a guest list. Check people off the list as they arrive - this keeps gate-crashers out. Try using some form of ID for entry eg. student card, paper invitation. Have enough adults to supervise. A good ratio is one adult to every 7-10 guests. You could invite a couple of the parents of guests to help supervise. Decide in advance what happens if someone becomes sick or is seriously injured eg. call their parents, emergency services. Set a start and finish time for the party. Guests should know when to arrive and when to leave. This helps guests arrange pick up times at the end of the night. Consider hiring a security guard or two. They can monitor the coming and going of guests throughout the party and be on hand to manage difficult situations that may arise. Register the party with local police. They can tell you about local laws regarding underage drinking and noise disturbance. They can also be there quickly if anything goes wrong and you need help. Let the neighbours know you’re hosting a party in case they need to make arrangements as well. Organise and buy a lot of food and non-alcoholic drinks. Make sure you have plenty to offer on the day. Set ground rules about what behaviour is expected. Be clear about whether or not drinking alcohol or smoking is okay. Try reaching out to the guests’ parents and let them know the ground rules too. If a party is shared on social media it’s hard to control who sees it - some parents avoid this by only using paper or email invitations. If you set up a Facebook event, make sure it’s ‘Private’ and ‘Invite Only’. Negotiate with your teen about who is responsible for cleaning up after the party. If using social media to invite people, only add the people on the guest list and maybe their parents too. But remember there’s no guarantee of privacy when using social media. You’re responsible for ensuring the party is safe. Take steps to prevent any issues before they happen. Have a single entrance – one way in and one way out. This means only those people who are invited are allowed in. It helps keep gate-crashers out. Designate an area for guests - confine them to this one area of the house or property. Lock or secure other rooms especially if you are concerned about property damage. Have a secure room for guests to leave their belongings in - including car keys and wallets. Have an adult supervise the entrance to that room or keep the room locked so guests need to ask permission before entering. Set up somewhere that guests can sleep over on the night of the party. You may have a few guests stay over unannounced, especially if they’ve been drinking and can’t drive home. Secure the perimeter of the property so guests don’t spill over into the neighbour’s property or onto the street. Some parents choose to have pets placed securely in another area of the house or property. If you have younger children think about setting up an area of the house for them away from the party, or organise for them to have a sleepover at a friend’s place. Now that you’ve prepared everything for the party, you can’t rest quite yet! Serve plenty of food at regular intervals throughout the party. If you carry around the food on platters it gives you a chance to check in with guests and see how they’re travelling. If someone faints or becomes unconscious consider calling an ambulance – people can die from a drug overdose or alcohol poisoning. Don’t let them ‘sleep it off’ without first checking on their safety. Some parents prefer not to drink on the day so they can remain alert and handle any difficult situations that might arise. Supervise pickups at the end of the night, especially if guests have been drinking. Keep them safe until their ride arrives. Allowing intoxicated guests to walk home could be dangerous. If they can’t arrange a ride home consider letting them stay the night. Have a security guard or an adult monitoring the entry/exit. Only let people into the party who are on the guest list and check them off the list when they arrive. Make soft drinks, juice and water freely available. Turn down the music late at night – the noise curfew varies by state and territory so check your local laws. Hosting a teen party is a lot of work but have fun with it! It’s something special that they’ll remember for a long time to come. 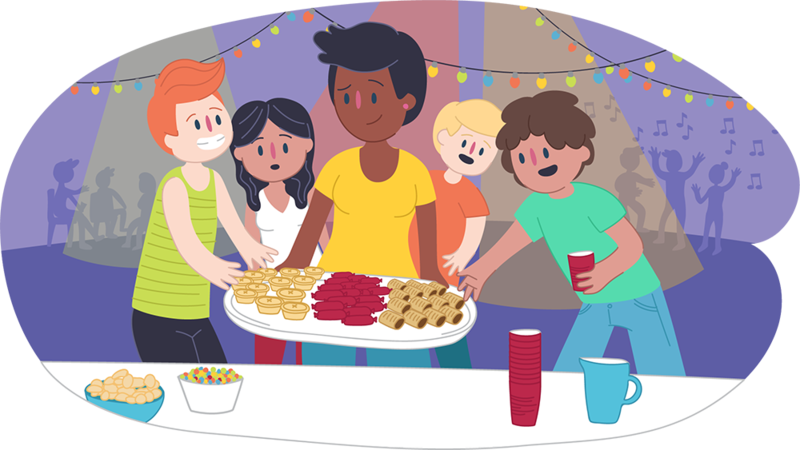 There’s a lot of work involved in hosting a safe teen party and these tips are a starting point for helping you plan and manage the event. If you’re feeling stressed or need some support call Parentline on 1300 30 1300 (QLD & NT) or check out the local Parentline service in your state or territory. Their counsellors can talk through any concerns you may have. Kids Helpline has information for teens about Partying Safely and Drugs and Alcohol. Check out the Teens section of this website.